Want to feel like a Greek God with a push of a button? In love with Greek mythology and all that surrounds its mysteries and tales? Then Divine Fortune is the slot for you, without a doubt. This 5 reel, 20 pay lines slot is a masterpiece from NetEnt and has a progressive jackpot that will keep you in your chair for hours on end. This is one game that has shown to pay well. See if it works for you. Not only that, but the game has a total of 3 jackpots that are fed by players from all corners of the world. There’s the Minor, and then the Major, and in the end, there’s the MEGA jackpot. It’s not necessary to state which one of those will get you the highest winnings. The spins will be filled with legendary Greek creatures and the animations of the game are great for setting the mood. 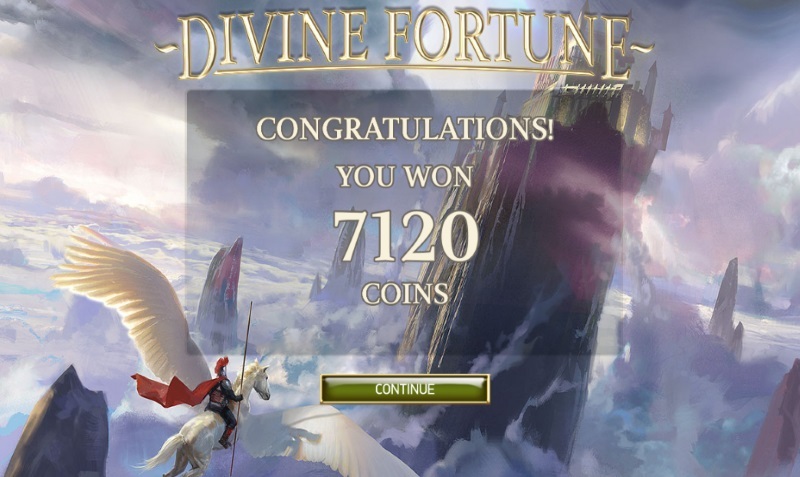 Combined with the music and the overall experience, Divine Fortune is simply one heck of a slot game! Besides the special symbols that we’ll be talking about in a bit, there are normal playing cards symbols that come up on the reel, like all face cards in a normal deck for example. Wild on Wild: Whenever you land on a Wild Stallion behind a Falling Wild, in the normal game-play or during a free spins series, you get the Wild on Wild Feature activated. That’s when the Pegasus Wild comes in and covers the whole reel. That means more wins and the chance for even more after the first spin, as the stallions stay on screen for 3 additional spins. Free Spins: In Divine Fortune, free spins come after you land on 3 or more of the dedicated symbols, which is the Lightning in the Hand symbol in this game. Landing on 3 of them will get you 5 free spins, 8 if you land on 4 or 12 if you get 5 of them at once. There’s also a chance of re-triggering more spins from the bonus rounds. Jackpot Bonus: Whenever you start playing this slot, you’ll see the progressive jackpot growing on you as you play, on the top of the screen. For a chance to win one of the 3 jackpots the game has to offer, you need to land on 3 or more Pegasus Gold Coins, special symbols dedicated to triggering the jackpot game. The jackpot round is only available from the base game. If you land on the jackpot bonus round, you’ll need to complete a set of rows made up of bonus symbols in a side game, with all of the spins being free. One row will land you on the Minor Jackpot, 2 will win you the Major one and 3, you guessed it, will bag you the MEGA Jackpot. Pegasus: This is one of the favorites of the game. Why? Because landing on Pegasus is going to trigger the Wild on Wild Feature, which is a must if you’re looking for some serious wins. Medusa: 3 or more of the Medusa symbols will trigger her eyes to flash at you and also give you a great win. This is the highest-paying symbol in the entire game, as 5 Medusa’s heads will win you no less than 600 credits or coins. That a truly mythological win! Minotaur: The part human, part bull creature will earn you a lot of credits. You’ll get 16 coins if you land on 3 Minotaur heads, or 300 if you land on 5 of them on one spin. The Eagle: In Ancient Greece, the eagle was the pet and messenger of Zeus. In the game itself, this is the lowest-paying symbol of them all, but will still land you on 200 coins if you line 5 of them up. Divine Fortune is one of the best slots for anyone to enjoy, regardless if you’re a beginner or an advanced player or if you play for real money or for fun. As with all of these games, do remind yourself to play them in moderation, and to never spend more money than you can afford on them. If you feel like they turn into an addiction, please consult with a professional.